Dr. Greg Gordon grew up in Gainesville Florida. At the age of 10 years old he decided to become a general pediatrician. He graduated from the University of Florida with an undergraduate Zoology degree. He continued at UF to obtain his medical degree. He completed his three year pediatric residency at the University of Alabama at Birmingham. He joined Pediatric Associates of Orlando directly out of residency. He and his family live in the Windermere area. 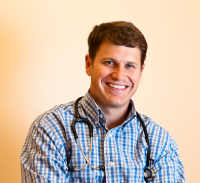 Dr. Gordon has practiced as a Windermere Pediatrician for more than 10 years. In 2009, the practice opened an office in Ocoee, just north of Windermere. While he does see patients in Orlando, Dr. Gordon's primary office is the Windermere office. Orlando magazine has named Dr. Gordon one of "Orlando's Best Pediatricians" each of the last six years. He is the chairman of "The Gift of Swimming". The Gift of Swimming is a Windermere based charity that provides swim lessons for needy children. See the Gift of Swimming 5K. He is married to Maggie Stirna Gordon and they have eight children (4 sons and 4 daughters). He enjoys playing basketball, Gator sports and camping with Indian guides.